Go to the ESPN Tournament Challenge group page and log into your account. Or sign up for a new account (both options are in the top right-hand corner, and you can utilize your Facebook details if desired). On that same page, search for the Axios Pro Rata 2019 group (search box is about halfway down the page). Create your bracket before the games begin Thursday at noon ET. Good luck! If you have any troubles with 1-3, please email me. 30.77 million shares being offered at $62-$68 per share. Market cap range of $17.6 billion to $19.3 billion. Fully-diluted market value of around $23 billion to $25 billion. All compared to its last private post-money valuation of $15 billion, set last summer. Activist investor Paul Singer this morning takes Lyft to task over its dual-class stock structure, via an op-ed in The Financial Times: "Public ownership must mean public accountability." A ride-hail driver protest against Lyft is planned for this morning, ahead of oral arguments in the company's lawsuit against New York City over its proposed minimum wage rules for drivers. • One to watch: Confirming one of Europe's worst-kept secret, German lenders Deutsche Bank and Commerzbank this morning said that they are seeking to merge. The merger could result in more than 10,000 job cuts — one labor union estimate is 30,000 — which is one reason that Deutsche Bank reportedly wants assurances of support from German Chancellor Angela Merkel. • Tax talk: Congress is again looking to close the carried interest tax loophole, which is kind of like saying that NY Mets fans are again looking forward to a championship season. This attempt is coming in both chambers, with Rep. Bill Pascrell Jr. (D-NJ) and Senator Tammy Baldwin (D-WI) sponsoring versions of what they called the Carried Interest Fairness Act of 2019. Private equity's top lobbyist is obviously opposed, calling it a "direct assault on capital gains treatment" and most of the support so far comes from Democrats. But it's worth remembering that President Trump has said he wants this loophole closed, even complaining to former top economic advisor Gary Cohn about it's lack of inclusion in the final 2017 tax bill. • Calendar: CalPERS, the nation's largest public pension system, today will ask directors to vote on a plan to launch a quasi-independent direct investing unit for venture capital and private equity. We first discussed the issue last May, and at least three of the board's 13 members have expressed reservations. Fidelity National Information Services (NYSE: FIS) has agreed to buy payments processor Worldpay (NYSE: WP) for approximately $35 billion (not including debt) in cash and stock, or $112.12 per share (14% premium over Friday's closing price). Why it's the BFD: Because it's a reminder that legacy payments companies won't go down without a consolidation fight. History: Worldpay was acquired just 19 months ago by Cincinnati-based Vantiv, which beat out JPMorgan, for just under $10 billion (combined co value at the time was around $22 billion). • The Jordan Co. agreed to buy Sabre Industries, an Alvarado, Texas-based maker of products for the utility and telecom markets, from Kohlberg & Co.
• PagerDuty, a San Francisco-based incident resolution platform, filed for a $100 million IPO. It plans to trade on the NYSE (PD) with Morgan Stanley as lead underwriter, and reports a $34.5 million net loss on $84 million in revenue for the first nine months of 2018. The company has raised over $170 million and was most recently valued at $1.3 billion, by investors like Andreessen Horowitz (18.4% pre-IPO stake), Accel (12.3%), Bessemer Venture Partners (12.2%), Baseline Ventures (6.7%), Harrison Metal (5.3%) and T. Rowe Price. Note: Base counts in parentheses. 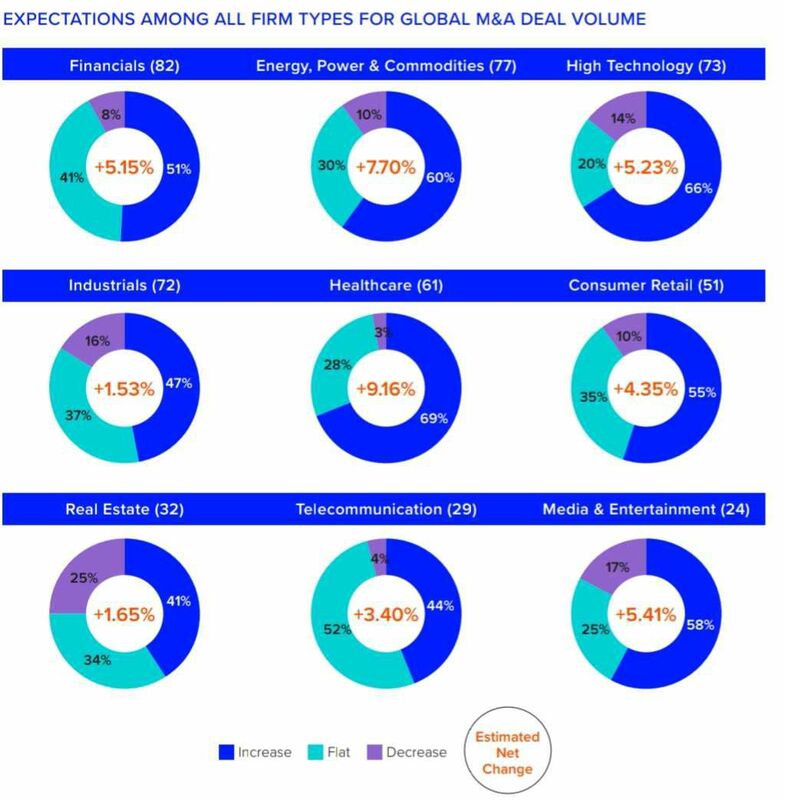 Source: Greenwich Associates/Refinitiv 2019 Deal Makers Sentiment Research Survey.